Some might call me cheap, but since I'm an English teacher, I will use the more flattering synonym, frugal. 😜 Because of this miserly trait, I'm a huge fan of yard sales and thrift stores--so much so that I always look at these places first before paying full price for anything! This includes shopping for items for my classroom as well. 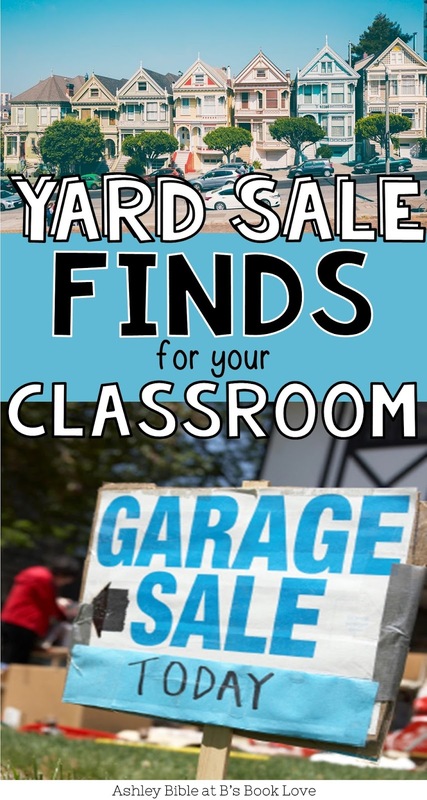 Here is a list of classroom items you are almost guaranteed to find on any yard sale shopping day. 1. Poster Frames- These make AWESOME dry erase boards if you simply turn the poster that's on the inside to the blank backside. I have two of these in my room and are on the hunt for more! They can be used for so many things like stations and group meeting spots. 2. Lamps- Correct classroom lighting is essential for creating a welcoming atmosphere in your classroom. I have never purchased a lamp anywhere else other than yard sales. They are SO easy to find, and you can spray paint them to match any classroom decor. Just do a quick "lamp revamp" search on Pinterest for all kinds of pretty lamp ideas! 3. Flexible Seating- I personally haven't been able to jump on the flexible seating train yet, but I'm already planning out my new flexible seating classroom design for when I return from my travel sabbatical. 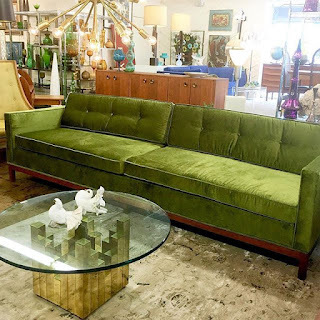 If I had a place to store some furniture items, I would have already bought five or six yard sale pieces for my flexible seating plan. While I've had some serious furniture FOMO, I know that I will be able to find lots of stuff when it's time to set up my classroom again because these type of items are everywhere! 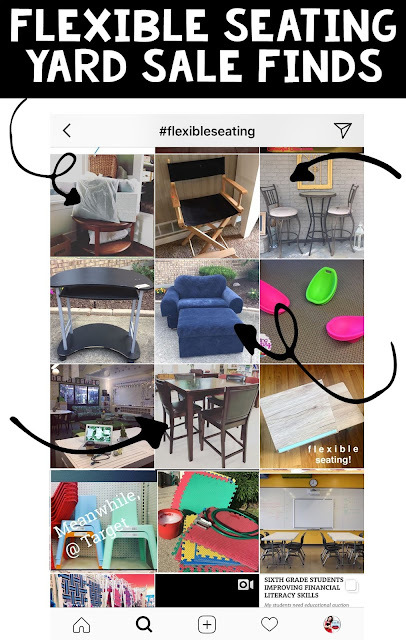 If you need some thrifting inspiration, search the hashtag "flexibleseating" on Instagram and you will see just how many teachers are finding lots of budget-friendly classroom furniture at garage sales and thrift stores! 4. Books- This one is kind of hit or miss, but I have found lots of YA books at yard sales throughout the years. One time I purchased about 5 YA books at a yard sale and just happened to mention that they were for my classroom when I was paying for them. About a week later, the sweet lady at the yard sale brought me an entire box of YA books to my school and left them in the office for me! If you don't find any books that can use on your bookshelf, you can most certainly find books for other purposes. For example, I use old dictionaries as a fun first-day activity as well as for making a decorative banner for my classroom. I love how these look hung up! 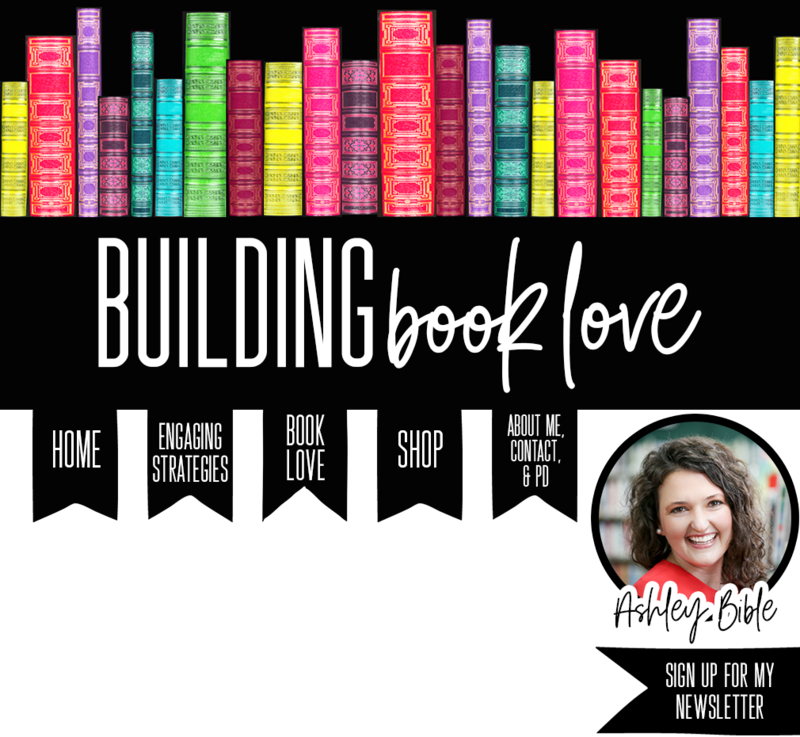 If you can't find any YA books, think about other books that students would be interested in. For instance, I did a "future ready" display and was really surprised by the interest in these how-to and self-help books! I found almost all of these second-hand. 5. Play Props- Clothing, costumes, hats, and toys are popular yard sale items. Instead of passing these up, think about how they can be used for learning! Of course younger students love dressing up, but it has been my experience that my high school students have fun with dressing up as well! Things like fabric samples and Halloween decorations go far with acting out reading scenes, plays, and historical settings. A "working" fireplace and mini mantel for $15! It works as a lamp as well as sound ambiance and goes perfectly with my Harry Potter classroom!